By converting electrical energy into motion, electrical motors literally keep our modern world turning. From compressors to ceiling fans, vacuum pumps to vacuum cleaners and dialysis machines to drones, motors are everywhere. They are so significant that entire books have been written about the different types of motors and advancements in motor control technology. In this post, we’ll discuss just some of the motor types we design and assemble here at Providence, along with the strengths and weaknesses of each type. Many of the motors we make for our customers are in the fractional (less than 1) horsepower range and span different alternating current (AC) and direct current (DC) motor types. Let’s begin with a popular DC motor design: the PMDC motor. PMDC motors are used in applications that require a small, inexpensive motor in places where only DC current is available, like in battery operated toys or in automobiles where precise speed control is not required. Their construction is simple. Since they use permanent magnets for the stator field there’s no need for the additional energy or circuitry required in other DC motors that use electromagnets for the stator (hence the smaller size and higher efficiency advantages of PMDCs). Larger PMDCs may augment the stator’s permanent magnets with coils, to provide a stronger field. PMDCs use brushes and a split ring commutator in order to deliver a reversing electrical current to the rotor, which in turn pushes and pulls against the stator field to rotate the rotor. Thus, the same drawbacks that affect all brushed DC motors including arcing and jerking at low speeds (from cogging torque), disturb PMDC motors as well. The characteristics of PMDCs have recently made it a popular choice for fractional horsepower applications, since high-intensity rare-earth permanent magnets (like those containing neodymium) have opened the door to high-power DC motors in a reasonable size. Now let’s discuss a few types of AC motors that have the advantages of being powered directly from mains voltage (whether single-phase residential or industrial three-phase). Since the current is already reversing, there’s no need for brushes and split commutators or their associated problems of friction, arcing, coasting through the gap in the commutator, electrical noise fed back onto the power supply, etc. Like the PMDCs we described above, this type of AC motor also uses permanent magnets. In a Permanent Magnet Synchronous Motor (PMSM) however, those magnets are built into the rotor. The AC current (usually three-phase) is applied to the stator coils, creating a rotating magnetic field in the area of the rotor. This motor type is called “synchronous” because the rotor spins at the same rate as the frequency of the AC supply. The use of permanent magnets alleviates cost, complexity and inefficiency incurred by supplying DC to electromagnets in the rotor. PMSMs powered by a three-phase AC, require a variable-frequency power source and usually use position sensors to detect the positions of the rotor poles. This is to ensure that the rotating magnetic field polarity is matched to the rotor’s field so that the motor spins in the correct rotation, produces the most torque, and operates at high efficiency. Some PMSMs are designed to run off of single-phase residential power and are used in applications like timers and water valve controllers, where they are commonly combined with a gearbox to leverage their ability to spin at a constant speed. The next motor type on our list is “asynchronous”, meaning the rotor spins at a slower rate than the power supply frequency. [/vc_column_text][vc_column_text]Induction motors work by relative motion of the stator’s rotating field moving across the rotor coils. When the rotor speed is low, the rotating field spins much faster than the rotor which induces a lot of current into the rotor, generating a strong rotor field that seeks to catch up with the rotating stator field until it is limited by a mechanical load. As the rotor’s rotational speed catches up to that of the stator field, the relative speed between the two decreases resulting in less induced current in the rotor, less torque, and thus less gain in speed. The rotor of asynchronous motors then, is always slower than the speed of the rotating stator field. 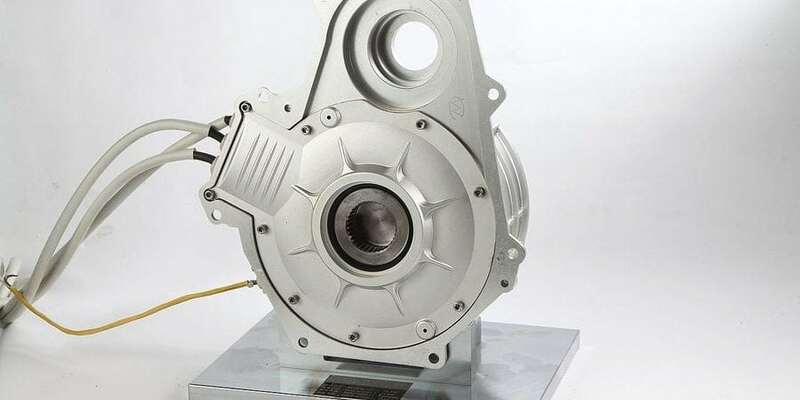 One common type of AC induction motor is the Squirrel Cage Induction Motor (SCIM) that gets its name from the loops of thick copper or aluminum bars embedded in the rotor which serves as the rotor coils. Three-phase SCIMs are very common in industrial applications because they are reliable, durable and cost-effective. In an induction motor, speed is determined by the frequency of the AC applied to the stator coils, and thus variable frequency drives (VFDs) are necessary for changing an inductive asynchronous motor’s speed. Sometimes the squirrel cage design is combined with another motor technology, which allows squirrel cage motors to be powered from single-phase AC. Single-phase AC applied to the stator coils would just produce an alternating magnetic field in the stator, and not the rotating field necessary to spin the rotor. Modifying the design of the stator poles however, can in fact generate the second phase needed. Shaded pole motors have an auxiliary one-turn coil covering part of each stator pole. This coil gets current passing into it by the reversing polarity of the pole it is shading. This current, lags the pole current (i.e. has a delayed phase relative to the pole current), so that you have two alternating magnetic fields whose phases are different enough to give you a 2-phase rotating magnetic field. Since this type of AC induction motor generates its own 2nd phase, it can be powered from single-phase AC. Shaded pole motors have low starting torque and are limited to less than one horsepower since other motor designs offer better performance at higher output powers. This means they are best used for fans and other loads without a lot of inertia. Motors are an important part of the modernized world and power many of things that we use or interact with on a daily basis so we often take them for granted. That’s why with over 400 skilled employees in our motor assembly department and expertise in many motor types, Providence can keep your motor design, components, controls and drive assemblies running smoothly and efficiently, to solve even your most challenging supply problems.